This item includes the pattern for Lisa The Unicorn and the Strip Roll made up of 15 fabrics, all from the Quilter's Linen range by Makower. The strips are cut at 2.5", across the width of the fabric. 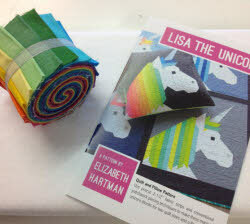 The colours have been chosen specifically to work with Lisa The Unicorn pattern. This pack includes a Strip Roll and a pack of 5" squares of matching fabrics (15 fabrics from the Fairy Lights and Bumblerries ranges from Lewis and Irene). You get 15 strips cut at 2.5" and 30 squares (5"). Brighten up the summer with these fabulous flamingos! The motifs can also be easily added to bags or other home décor. Feel tropical with these two lovely pineapples! They can be used to decorate bags or cushions. This pattern gives you the instructions and templates for the unicorn head on the right of the picture. As a bonus pattern you also get the small unicorn head on the left. Gail has appliqued it on a cushion. Feel free to use it as you wish. 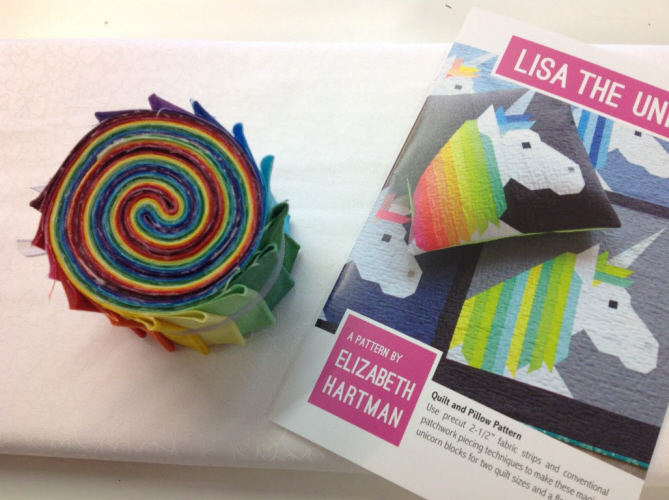 This pattern is for the large unicorn head (right on picture). Bonus pattern for the smaller unicorn is enclosed. As an example I have used it on a cushion front. Feel free to use it as you wish! · Small piece of pink Minky or other fabric for muzzle and inner ear. · Other embellishments optional to decorate. This fabric has been digitally printed.